I want to show how the puzzle can be solved with constraint logic programming and ECLiPSe CLP. Constraint logic programming is a logic programming extension that includes concepts from constraint satisfaction. 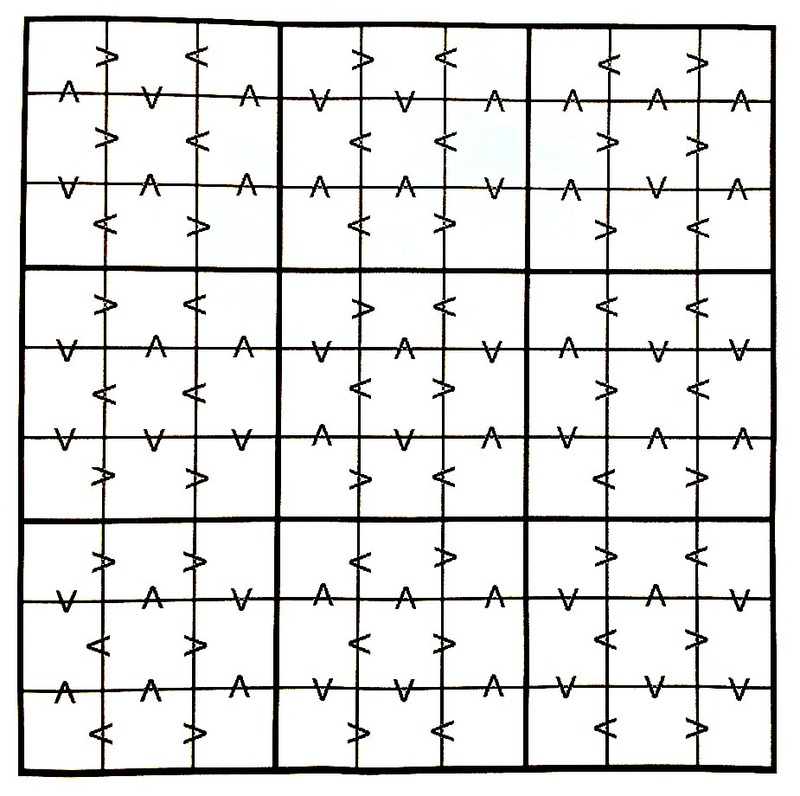 This paradigm can be very handy for solving grid puzzles like Greater Than Sudoku. ECLiPSe CLP is an open-source Prolog-based system with a good support for modeling and solving problems with constraint logic programming. search(Sudoku, 0, most_constrained, indomain_min, complete, ). Conceptually, the program is very simple: we define a 9×9 array of integer 1..9 variables, constraint every row, column and square to have different values, and impose greater-than constraints according to the problem. Then using the find predicate we find concrete values of the variables that satisfy the model constraints. most_constrained and indomain_min are heuristics that the search will use, but any other heuristics should work for our small problem (see http://eclipseclp.org/doc/bips/lib/ic/search-6.html for all possible options). The problem predicate encodes rows of horizontal and vertical greater-than signs of the given puzzle (v and ^ denote vertical greater-than signs). Most of the (somewhat complicated) code in model is for finding row and column value indexes for a particular greater-than sign. The program is declarative: we don't say how to find the values we want, we only say which constraints the values we want must satisfy. Almost every modern logic programming system supports constraint programming, so it shouldn't be too hard to translate my program to SWI-Prolog, Mercury or Picat. For more examples of solving grid puzzles with ECLiPSe see Hakan Kjellerstrand's ECLiPSe page.